Like the design of this park. Good level site and good 50 amp electric. Highly recommend this park. We travel in a 37′ motor home with tow. Easy in and out for me. This campground is right off the highway on the outer service road. Stayed a week and enjoyed ourselves. Asked for shade and we got it. Very nice campground and people. We stayed a few days to visit with our family. They parked us close to the pavilion so we could make good use of it with the family. This allowed us to prepare a nice place to meet and eat. Would stay here again for sure! Nice people, nice park. Good pull-thru level site. Have a 40′ motor home towing. Would stay here again. A very convenient park. Had everything we needed. All sites have full hookups, cable TV and Wi-Fi. This park is close to town about a 3 minute drive. Grocery store, hardware store, banks, and a large hospital is located at the first stop light. Very convenient. Town is larger than we expected about 6 miles long. Great places to eat and many more stores. Traveling in a 37 foot 5th wheel with 2 dogs. We will stop again on our next trip. Great Park. Had my trailer parked here for 4 years so I could travel back and forth to work. The owners and staff were very accommodating to any of my needs. Park is very clean, quite, and well maintained. Everyone is very conscientious of all the campers. Also accommodating to campers with pets providing a designated area for pets to be exercised and use the bathroom. Guests help to keep the area free of potential diseases by utilizing this space and cleaning up after their pets to allow the park to stay clean. I would highly recommend Camelot RV to anyone who is looking for a nice place to stay! Enjoyed our stay. 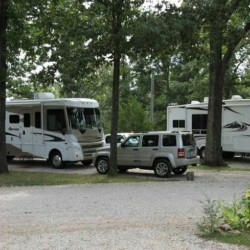 Very nice campground and they have a large pet area, it is not fenced in but well maintained. Long pull-thru sites, good hookups and cable TV. Have a 40′ motor home towing. We will be back!!! Good location just off the highway. We registered and was escorted to our site. The site was long enough for our motor home and tow. Good 50 amp electric. We unhooked and visited the town and found it to have many restaurants, stores and shops. We didn’t expect most of the main streets to be 4 and 5 lanes. Easy to get around. The office will provide you with a city map if you need one.